Valley of flowers is a UNESCO world heritage site along with Nanda Devi National Park. 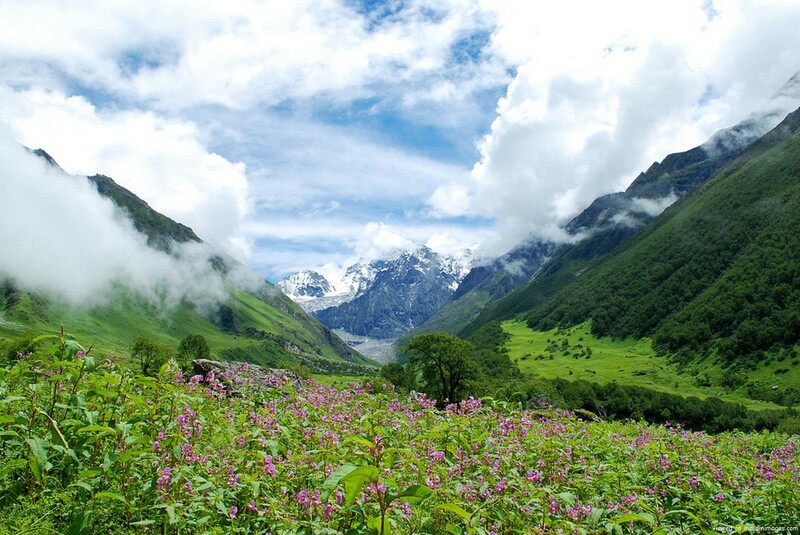 Valley of flowers is situated at high altitude in Chamoli districts in the North Indian state of Uttarakhand. It is a paradise for trekkers, nature lovers and photographers. It is a high-altitude enchanting valley situated in the transitional zone of Zanskar Valley in the lap of Himalayas. A botanist and mountaineer Mr.Frank S Smith discovered the Valley of flowers. Mesmerizing valley is famous for more than its 400 endangered species of alpine flowers in pristine form that blossom as monsoon approaches every year. It is also known for breathtaking meadows, picturesque landscape, overwhelming mountainous natural beauty. It is also said to have been inhabited by fairies in the past time according to local’s belief. If you want to get rid of cities hustling – bustling life and looking for a place away from so called civilization, than Valley of flowers is a best place to get. It is an eye-catching and breathtaking national park in the lap of Himalayas surrounded by Nepal and Tibet. It is appeared as a carpet of countless coulors spread over Valley of flowers due to varied range of flowers get full bloom during monsoon season. Visiting hours to Valley of flowers is from 06:00 am to 06:00 p.m. Last settlement in the valley of flowers is Ghangaria as a base camp. One has to trek down to the Ghangaria by 3 p.m as camping and lodging is prohibited up there in the Valley. Trekking to Valley of flowers start from the place called Govindghat. Road is motorable up to Govindghat only. One can get this place from New Delhi by road, air and trains. By Road: To get the Valley of flowers by road. One has to drive up to the place called Govindghat following “Delhi-Haridwar-Rishikesh-Joshimath-Govindghat” route. Govindghat is 500 km away from New Delhi. To cover up all distance in one day is not advisable as there are lots of hill drive involves. By Train: Nearest railway station is Haridwar which is at a distance of 284 km from Govindghat. There are several good trains being run between New Delhi and Haridwar. One can get down here and take a rented car or a bus to Joshimath, which is a final big town near Govindghat at a distance of 22 km from here. By Air: Nearest Airport is Jolly grant Airport in Doiwala situated at a distance of 272 from Joshimath. Rented taxies are easily available for Joshimath or otherwise take a cab up to Rishikesh Bus Station to get Buses for Joshimath on regular basis. Best time to visit Valley of flowers is between June to September. July and August are the month when flowers are emerged at full bloom. Valley of flowers blossom during monsoon season when more than 400 endangered species of alpine flowers are found in their pristine form in the valley such as rare wild flowers such as Brahma Kamal,Geranium, Marsh marigold, Prinula, Potentilla, Geum, Asters, Lilium, Ranunculus, Corydalis, Inula, Braham kamal, Campanula, Pedicularis, Arisaema, Morina, Impatiens, Bistorta, Ligularia, Anaphalis, Saxifrages, Sibbaldia, Thermo- psis, Trollius, Codonopsis, Dactylorhiza etc. Valley is 10 km long and 2 km wide in size, now you can imagine how beautiful it looks like a carpet of colorful flowers painted on it. Delhi is a good point to start the tour. Trains and flights are available on regular basis from Delhi to get the closest point to Valley of flowers. Last stop for the trains is Haridwar whereas Jolly grant Airport Dehradun is final destination for flights from Delhi. You need to have at least 7 to 8 days to complete the tour from Delhi or 5 to 6 days from Haridwar with comfort. Journey should be breaking up at various points from Delhi such as Haridwar or Rishikesh, Joshimath, Ghangaria etc. Once landed at Govindghat, there is a trek for 14 km to get base Ghangaria where an overnight stay is needed on reaching. Next day morning is a day to trek to Valley of flowers. Valley opens only after June, it is forbidden due to snow before June. So plan your trip between June to September. Carry all rain gears because when it rains during monsoon, it can get quite cold and uncomfortable. Ghangaria is the last settlement close to Valley of flowers. There is a trek for 14 km to get Ghangaria from Govindghat. Government guest houses, small hotels and lodges are easily available up there in Ghangaria. If you are looking for luxury accommodation, this is not a place for you. Very basic hotels and camps are there to stay .Electricity and water supply remains for couple of hours only here. When it comes to the facilities en-route to trek, there are Mules and Palkies available at Govindghat. Hemkund Sahib is a popular Gurudwara (pilgrimage for Sikhs and Hindus) located at 4329 mt above sea level near Valley of flowers. There is a diversion of trek from Ghangaria to Hemkund Sahib for 6 km. There is a lake near main shrine called Hemkund surrounded by snow peaks. It is an optional trip one can take up on trip to Valley of flowers. There are many other places to see while on way to Valley of flowersTrek such as Badrinath, which is an abode of Lord Vishnu. Trip to Valleyof flowers is must visit place once if life time as this place is out of the world.